The dark patches on a coconut are its "eyes." Nothing tastes of the tropics quite like a fresh coconut. Though it takes a bit of brute force to open the tough hairy shell, the sweet coconut water and bright white flesh make a coconut a refreshing treat. However, if you crack open a coconut and a sour alcohol smell emerges, then the nut may have gone bad. The best way recourse is to choose a fresh nut. When coconuts have been stored for a long time, they slowly start to go bad. Similarly, if the shell has been punctured during transportation, the milk inside can ferment and leak out. Whether you're buying a young green coconut or a mature brown version, the nut should feel heavy. When you shake it, you should be able to hear the liquid inside. 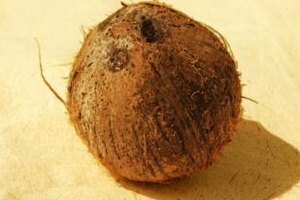 This suggests that the coconut is intact and the flesh inside is not moldy or spoiled. At the top of a coconut are small, dark indentations known as the "eyes." If they're extremely dark, this suggests the coconut is old. If these are damp, sunken or punctured, then discard the coconut. White spots around the eyes point to mold growing from inside the nut. Check all around the shell for signs of cracks, splits or holes. Avoid any coconuts with damaged shells. No matter how closely you inspect a coconut shell, you'll only know for sure if it's good to eat when you open it up. Coconut shells are so tough that you need a hammer and a strong skewer or screwdriver to crack the shell. Aim the skewer at one of the softer "eyes" near the top of the nut and tap firmly with the hammer. 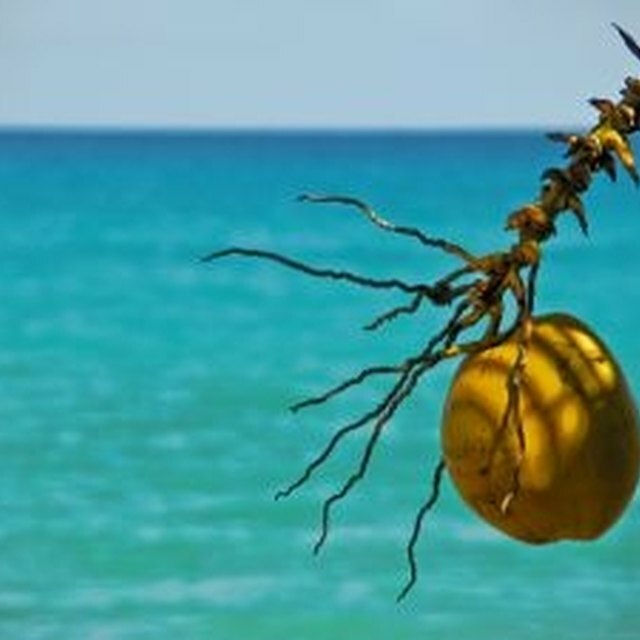 Any smells of mold, soap, chemicals or alcohol that come from the pierced coconut mean it should be discarded. Even if you buy a fresh coconut from the store, it can go bad left in your pantry. Leave it for too long, and an alcohol-like smell can result from the milky flesh. To keep the coconut in good condition, store it in the refrigerator. Even if the coconut smells okay once opened, it has turned bad if the flesh has turned gray or mushy. Does Coconut Milk Curdle in the Heat?